I spent the morning going through worn out kids clothes and making a list of housework and projects that need doing. Just like every other year I love the summer, but I look forward to fall schedules and getting the house clean and back in order! While I’m at it, I’m also catching up on my older work in progress quilts that I haven’t finished. 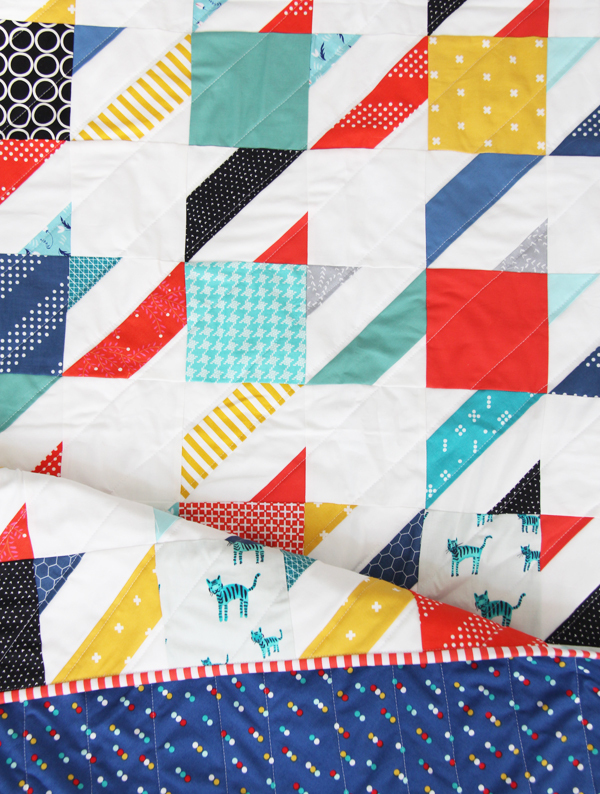 I made this scrappy houndstooth quilt top towards the end of 2014 using this tutorial to make the diagonal blocks. The navy backing is from Dixie in stores now, it coordinates so perfectly with the colors of this quilt. I quilted simple straight-ish lines, bound it with an awesome red stripe and called it done! Next I’m going to tackle the boys room…I’m kind of scared to look under their beds. I love your quilt. It is really fresh. Good luck with the boys room! I love the colors and the pattern in this quilt. I think I might be able to do this. This pattern has been on my to-do list, but I couldn’t come up with a color scheme. I hadn’t thought scrappy – love the idea. Your quilt is so fun! What a nice quilt! I like that the colours are bright and saturated and boy-ish- sometimes hard to accomplish. I will have to check out this method using diagonal blocks. 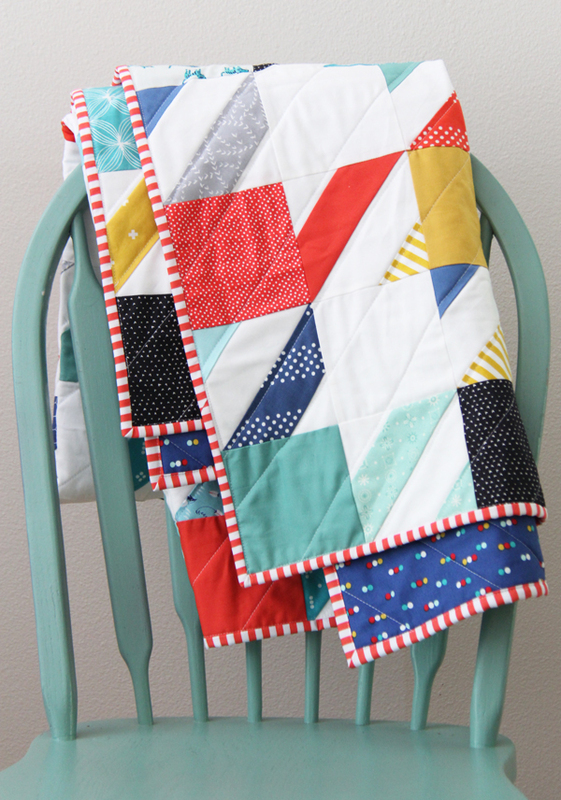 Darling quilt – love that Dixie backing!!! Hold your breath when you look under the boys beds….and good luck! 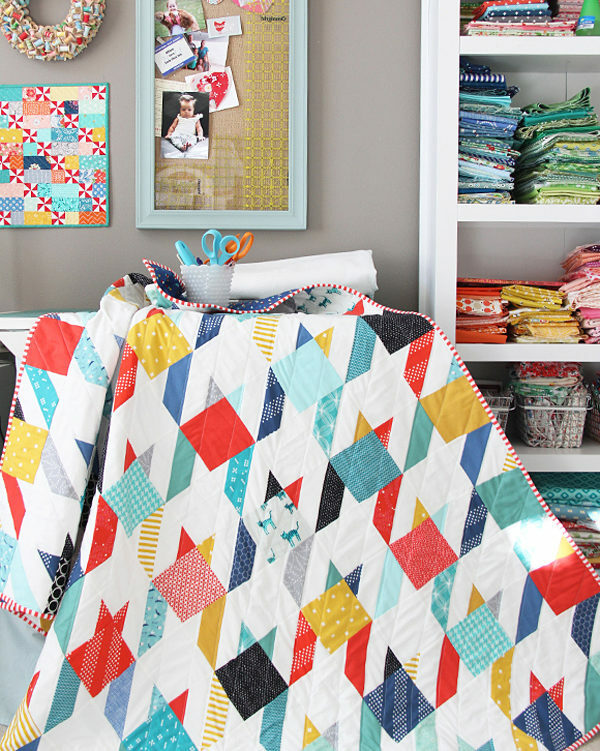 Do you have a tutorial for that little pinwheel wall hanging in the background? It’s a pattern in my Mini Quilt Booklet (in my pattern shop). So darling and cheery. Thanks for the tiki total link too. I love this quilt! I’m VERY new to quilting. Just watched the YouTube tutorial on how to make the strips blocks. Seems easy peasy. Is that how you did your stop blocks? Love this. It is so fresh and crisp. The quilt is so very, very cute. I can attest to the scary things one finds under boys’ beds. Under a girl’s bed, one can find the missing phone no one has seen for three months. Naturally this phone has run out of charge long ago so no one could hear it ring. Even when the ring could be heard, it couldn’t be heard from the crush of stuffed animals, tights (a long time ago), clothes, etc. 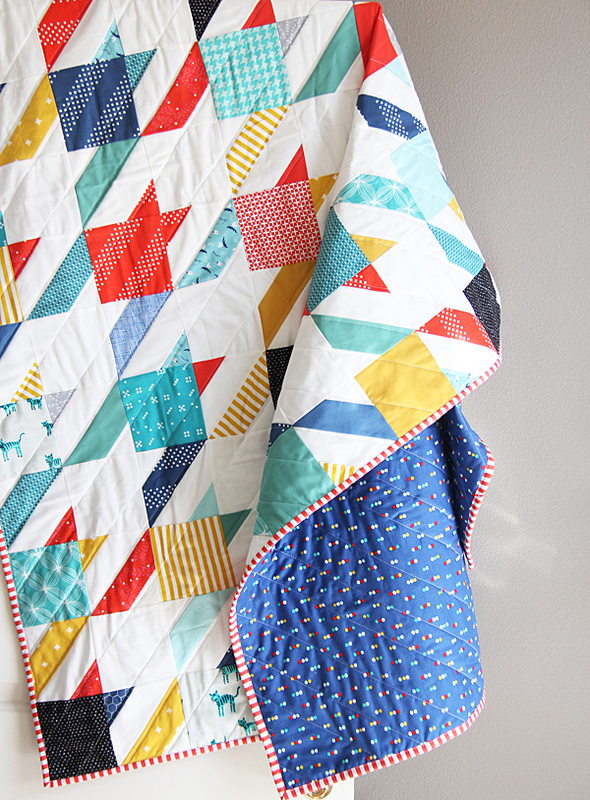 As always – love your fabrics, quilt, and thanks for sharing. The colors are great. Amazing how much you get done with a new baby and I have no excuses so, I better get with it. I love this quilt. You have inspired me to make one. I had some FQs that were begging to be used. Lol. Thank you for sharing. I love your work.